This post is a static reproduction of an IPython notebook prepared for a machine learning workshop given to the Systems group at Sanger, which aimed to give an introduction to machine learning techniques in a context relevant to systems administration. The workshop was split into two halves: supervised learning and unsupervised learning. The supervised portion was produced by Elena Chatzimichali; the unsupervised half is what you see below. 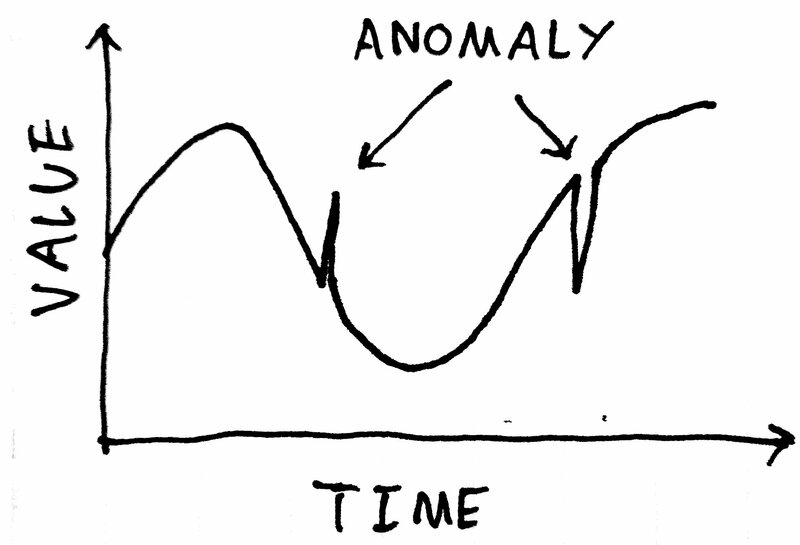 We take a look at a simple example of k-means clustering for anomaly detection in time series data. This example is based on Chapter 4, More Complex, Adaptive Models from Practical Machine Learning by Ted Dunning and Ellen Friedman. The source for the notebook and listings of the full code developed in the workbook are available on GitHub at https://github.com/mrahtz/sanger-machine-learning-workshop . Update: Majid al-Dosari (in the comments below) and Eamonn Keogh point out that there may be issues with the approach described here for the reasons outlined in Clustering of Time Series Subsequences is Meaningless . This material still serves as an introduction to unsupervised learning and clustering, but beware in using it for anomaly detection in practice. Say we have a record of how some value changes over time - hourly temperate in California, or number of visitors to a website per minute, for example. A lot of these kinds of records will have a regular shape or pattern that is indicative of some kind of "normal" behaviour. A deviation from this regular pattern - an anomaly - may indicate that something funny is going on. Maybe a load balancer has failed, or maybe a cluster user has submitted an overly-large job. If we can detect such anomalies automatically, then we can investigate as soon as the problem happens, rather than hours or days later when users start complaining. 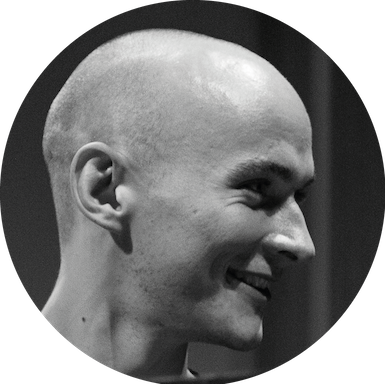 What we want is more a method that can learn what constitutes a "normal" waveform, not just in terms of its instantaneous value, but in terms of its shape. 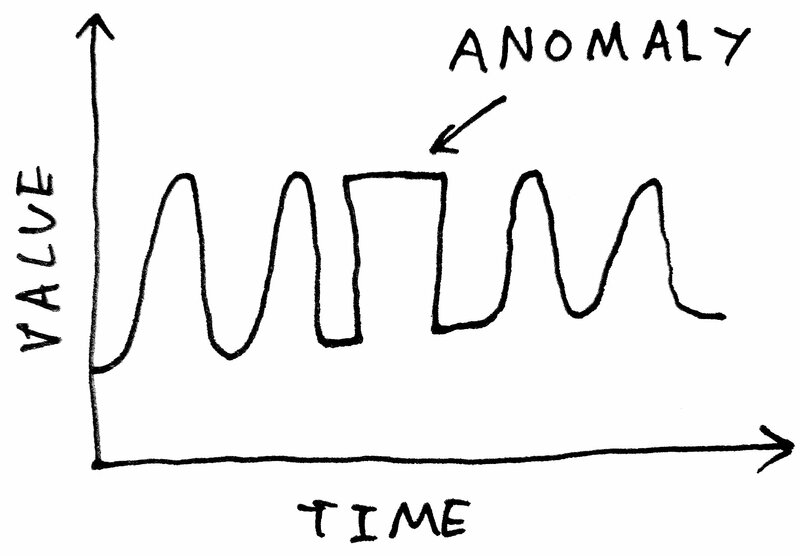 Our approach will be to define an "anomaly" as being some pattern in the waveform that hasn't been seen before. Our algorithm will build up a library of "normal" waveform shapes, and use that library to try and reconstruct a waveform to be tested. If the reconstruction is poor, then the waveform is likely to contain something abnormal, and is therefore anomalous. To explore how we might go about determining what counts as normal, let's take a step back from our problem and have a look at a simpler example. 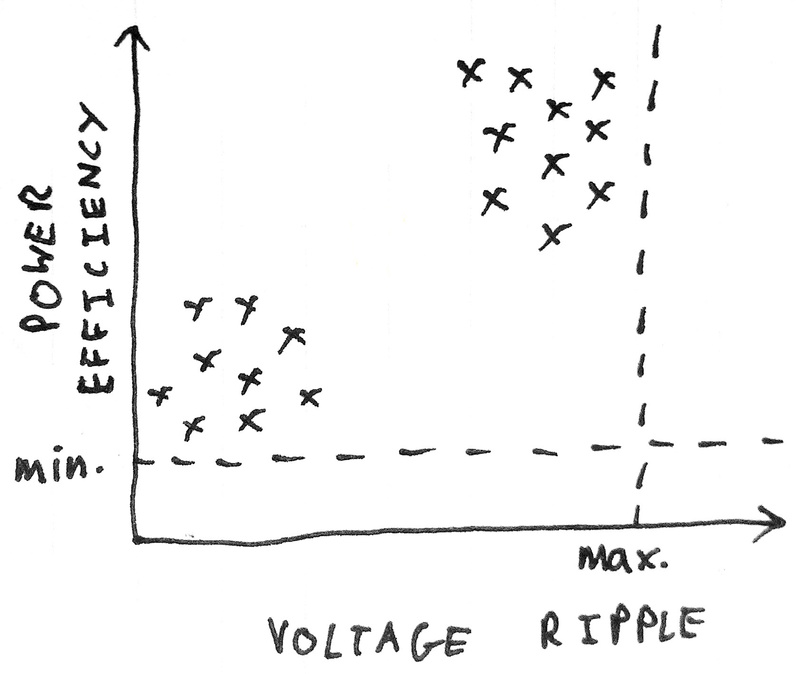 These two variables have acceptance tolerances, as shown by the dotted lines. Within these limits, however, we find that the data tends to form two groups, or clusters, depending on which type of capacitor is used. This is a sign that there might be something wrong with the unit; that it is in some way anomalous. To apply such a technique to waveforms, we'll need to decide how we're going to define the space in which clusters will be formed. First, we'll need to split the waveform into segments to give us separate "samples". But what will our features be - what are the variables that will define the n-dimensional space? We could go with standard measurements of each segment such as maximum, minimum and spread. But since our technique is generalisable to any number of dimensions, we can do something a bit more clever: we can take each element of the segment as a separate dimension. For a segment containing 32 time values, we define a 32-dimensional space. It is in this 32-dimensional space that we will form our clusters of waveform segments. In the example of the power supplies, we detected anomalous samples based on the distance from clusters. For our waveforms, we're going to take a slightly different approach so that we can visualise what's going on. Note that the centroid, being a point in the waveform space, is itself a waveform. Thus, the cluster centroids provide us with a set of "normal" waveform segments. Suppose we then try to use our set of "normal" segments to reconstruct a set of data to be tested. If the data is similar in shape to what has come before it, we will be able to manage a good reconstruction. However, if the data contains some abnormal shape, we will not be able to reconstruct it using our normal shape library, and we will get a reconstruction error. This error will indicate an anomaly! 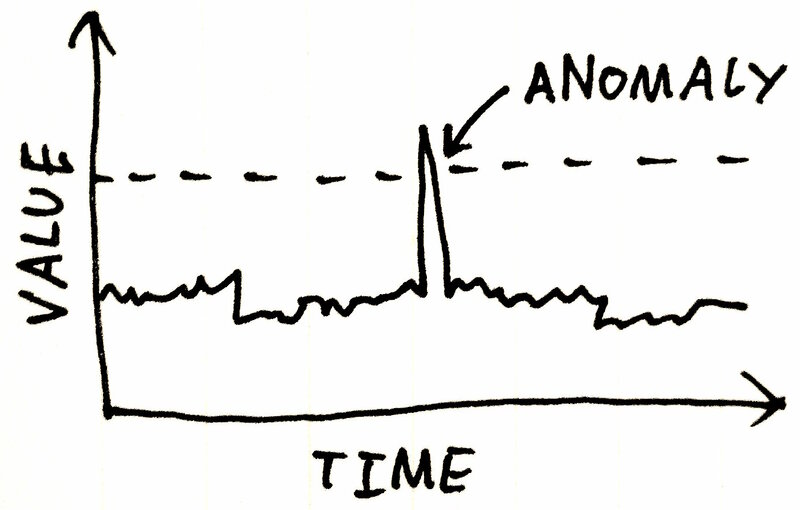 To explore anomaly detection, we'll be using an EKG data set from PhysioNet, which is essentially the squishy version of the data we'll be getting from servers. Since this data has a very regular waveform, it provides a good vehicle for us to explore the algorithms without getting bogged down in the complications that come with real-world data. The data is supplied in the a02.dat file. A Python module ekg_data.py is provided to read the data. Note that these segments do not necessarily begin and end with a value of zero. This could be a problem later on: since the learned "normal" segment will then also have non-zero starts and end, when we try to reconstruct our waveform to be tested by adding together our learned segment, we'll end up with discontinuities. Plotting the result, we see the difference that the windowing process makes. The segments are now flat at the start and end - perfect to be joined together later. Note that windowing also has the effect of making the segments less affected by the waveform either side of the segment. The waveform shape represented by the segment is now more "concentrated" in the middle. Next, we cluster our waveform segments in 32-dimensional space. The k-means algorithm is provided by Python's scikit-learn library. The clusterer appears to have learned a small number of basic shapes, with various horizontal translations. This time, we only need enough overlap between segments to allow us to stitch the reconstructions back together again, so we'll go with an overlap of half a segment. Before trying to reconstruct the whole thing, we can check how the reconstruction fares for individual segments. Try changing the segment index (if you're running an interactive version of the notebook) to see the reconstruction for different segments. Looking good! So now, let's go ahead and try and reconstruct the full set of data. The reconstruction is not bad at all! Since our anomaly has produced a shape in the waveform that hadn't been seen before, the waveform around that point couldn't be reconstructed using the learned shape library. This gives a large, easily visible reconstruction error! This error could be easily detected using a simple threshold detector. We've looked at one example of the use of unsupervised learning techniques in systems administration: anomaly detection of time series data based on reconstruction error from k-means clustering. This problem could have been solved in different ways. For example, we could have trained a predictive neural network model, and examined the difference between the predicted waveform and the actual waveform. In general, there is no 'one size fits all' solution in machine learning - different techniques will be required for different problems. A standalone script containing our full set of code is available at https://github.com/mrahtz/sanger-machine-learning-workshop as learn.py.